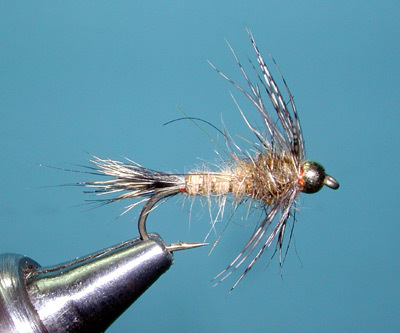 Notes: Dave Whitlock developed this pattern in the late 1960's and considers it one of his best nymph patterns. 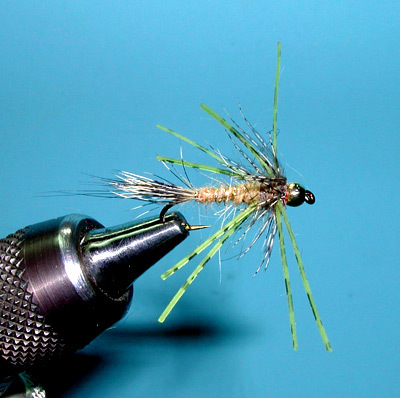 The pattern can be tied to represent October Caddis, Mayfly Nymphs, Caddis Emergers, and even Little Yellow Stonefly Nymphs. 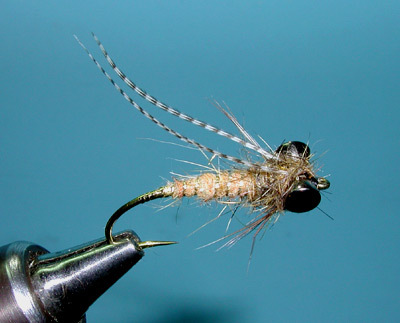 The impressive aspects of this fly is that it has been a consistent performer for nearly 40 years used upon a wide range of species of trout ,char, and whitefish due to the impressionistic design. Dave was influenced by the fur-bodied nymphs tied by Polly Rosborough, Thom Green and Ted Trueblood. Not having the furs they used, he gravitated to the Red Fox Squirrel due to local availability. The material maintains a very appealing and active movement within the water. 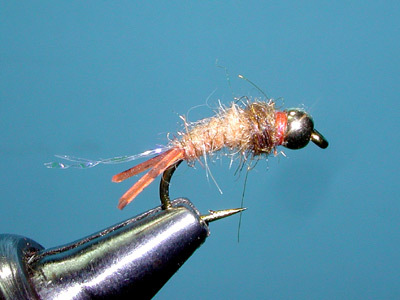 Using both the squirrel belly and the back fur makes this fly unique, giving it a reddish brown appearance. 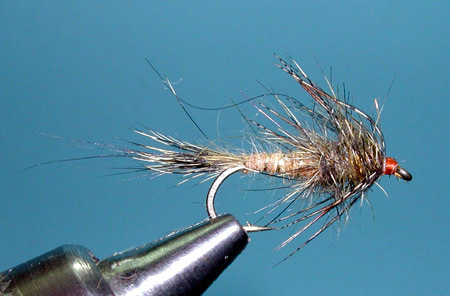 Air bubbles and light on the fur give the fly a distinct halo of liveliness. Dave uses a Blend of fur and synthetic sparkle dubbing in a 60:40 ratio (natural to synthetic) for the abdomen and in a 70:30 ratio for the thorax for the best dubbing properties.For the thorax blend, cut or chave the back hair off the skin and mix it thoroughly is a small coffee-grinder-type blender. Cut Yarn or synthetic dubbing into 3/8 to 1/2 inch lengths. Place the synthetic in the blender and mix it thoroughly. Take a 70/30 portion of fur and synthetic and blend those together.For the abdomen blend, cut or shave belly hair off the skin and repeat the procedure outlined above except for the belly fur synthetic color and the 60:40 fur to synthetic ratio. Dave markets these blends as SLF dubbing. They have all of his colorations for his nymph patterns. No wing case is necessary. His original RFSH nymph had a mottled dark brown wing case but tests have proven the fly is as effective, or even more effective, without the wing case.